TUCSON, Ariz. — NASA’s newest rover, the massive Mars Science Laboratory Curiosity, is less than two months away from plunging into the thin atmosphere of the Red Planet — a harrowing seven-minute dive that will use a landing never-before attempted on another world. Back on Earth, scientists and engineers on the Mars Science Laboratory (MSL) project are busily preparing for the Aug. 5 PDT landing of the mission's 1-ton Curiosity rover. And there's a lot riding on the success of the ambitious mission. The nuclear-powered MSL mission's price tag is not small potatoes. To date, the rover has cost $2.5 billion, including $1.8 billion for spacecraft development and science investigations and additional amounts for launch and operations. So there's no doubt that the MSL rover is a high-stakes Mars mission. As one high-ranking NASA Mars mission leader recently said: "We know it will land … but the only question is how fast will it be going?" "We are getting ready for landing …sort of cramming before the final," said Richard Cook, deputy project manager for MSL at the NASA Jet Propulsion Laboratory in Pasadena, Calif. "We’re doing a lot of rehearsing [for] how operations will be conducted," he said, speaking here at the Spacefest IV conference, which ended June 3. The target of choice is Gale Crater, with Curiosity making its touchdown within a precise landing ellipse. That ellipse is shrinking in size, Cook said, "because of how well the spacecraft is going to Mars." Instead of being 15.5 miles by 12.4 miles (25 km by 20 km), it’s more like 12.4 miles by 6.2 miles (20 km by 10 km), Cook added. "That means driving less to get to the Promised Land that the scientists want to look at," he said. Gale Crater spans 96 miles (154 km) in diameter and sports a mountain — dubbed Mount Sharp — that rises about 3 miles (5 km) above the crater floor. Nearly six years of deliberations led to picking Gale Crater, Cook said, a site "where not only there could have been a good habitable environment in the past …but it’s preserved to today. It is a history book of ancient times." But getting Curiosity down safe and sound means performing a high-tech aerial ballet above Mars using the Sky Crane. Hovering above Mars, Sky Crane is a big propulsion system, armed with sophisticated radar hardware. When the descent stage senses it has slowed to nearly zero velocity over the planet, Curiosity will be released. A Sky Crane bridle system will spool out the rover to the ground. Curiosity is to be set down at a velocity of about 1.7 mph (2.7 kph). 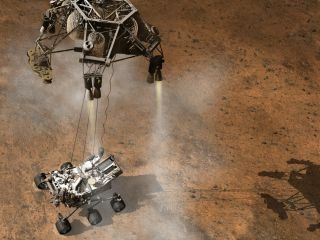 When the Curiosity rover feels a soft touchdown, the connecting cords between rover and Sky Crane will be severed. The Sky Crane descent stage will then rocket itself to a destructive landing far away from the rover’s location. "It crashes about a kilometer away from the rover," Cook said. "We wanted to get it far enough away … get it way over there. Obviously, we don’t want a scenario where the descent stage falls on top of the rover." Cook said that evaluating on Earth how the Sky Crane system will work on Mars was not possible. "The dynamics of the Earth's atmosphere and the gravity change the system in a way that makes it impossible to test, end-to-end, the landing system," Cook said. It was done piecemeal, he said, with test evaluations of different hardware elements glued together to prove that the landing system will work all at once. "So when we get to Mars, it’ll be the first time we’ve ever done the whole thing end-to-end," Cook said. MSL’s entry phase at Mars takes all of seven minutes, from the top of the atmosphere to the ground. "The vehicle will have traveled about 500 million kilometers … to get into the right entry angle and to make sure it survives the entry into the Mars atmosphere," Cook said. Given one-way communications at the time between Mars and Earth of 15 minutes, the spacecraft is under its own, autonomous control. "By the time we hear about it, it’s already all done. So the vehicle has to do everything on its own," Cook said. Once Curiosity is on Mars and in ready-to-roll mode, don’t expect the rover to start putting pedal to the metal right away. Depending on the rover’s status, a tentative plan is to start driving Curiosity in the middle of September. However, expect pictures almost right away from Curiosity’s landing locale, Cook said. "It will take us a while. We’re not going to press the gas very fast on this thing. It’s a very complicated vehicle," Cook said. "We want to make sure it’s all okay before we really start going quickly." The rover's design warranty is for one Mars year, about two Earth years, Cook said. But like the still-operating Mars Exploration Rover, Opportunity, no telling how long Curiosity will be on-duty. Curiosity is fully loaded, off the showroom floor with almost two of everything in terms of critical electronic components. Mechanical parts, well, that’s another issue, Cook said. "I would expect it to last for quite a long time. Whether it is in the Opportunity-class, that would be great, but hard to bet on that," Cook said.